I was born and raised in the Sea Org, Scientology’s strict upper management organization. Signed my first Billion year contract when I was 9 years old. It was a very sheltered closed-to-the-outside-world upbringing. I left the Sea Org when I was 21, the most difficult thing I’ve ever done. I learned how to drive, opened a bank account and began to learn about a world much different from what I was taught growing up. Within a few years, I started a job in the Film and TV industry in Los Angeles California. I also began to explore the world in bits and pieces starting with a few weeks driving across the Yucatan Peninsula with my buddy Shane. Embracing my passion for the outdoors and exploring I set out on a 2-day solo backpacking trip into the local mountains. I was ill prepared for the California heat and lack of water availability but I came out the other side knowing much more and began to realize how much I loved the outdoors. Going on outdoors adventures was my primary pursuit in my 20s and something that defined my trips and consumed most of my free time. That was when I didn’t have a strict deadline for a TV show that needed to air or a film that needed to screen. A job in the film industry sometimes has a tendency to consume most of your life. In my mid-twenties I took a look at my life and begun to realize that I was working paycheck to paycheck. I had a nice car and a nice apartment and some pretty cool stuff. But that doesn’t really make you happy. I was working day in and day out for stuff, stuff that I could only enjoy on the little bit of time off that I had. I didn’t hate my job by any means and I wasn’t working in a cubicle like some travelers whose stories I’ve read, but it just wasn’t the way I wanted to live my entire life. I decided that I wanted to see the world and get the education I missed by traveling around it. And so I began to cut my expenses and slowly began to save my money for it. I also began to focus more on those things in life that made me happy, the outdoors. Over the years something always got in the way or it just didn’t seem like the right time to leave. A lot of it was work. I had a good job and a great boss. Before leaving on my trip I was getting out into the local mountains 3 to 5 times a week. Waking up at 4 am and packing my bag to go explore a new canyon. Hiking, rappelling, climbing and more hiking all before showering and rushing to work. Or I’d get off work in the evening, meet up with a group of friends at a local trailhead, ropes, helmets, and harness packed and we’d all go and rappel through a canyon, sometimes even having late night potlucks in the wild. It was a good and fulfilling life but the itch to see the world never left me. And then it finally happened. In April 2016 I needed to go to Italy for work. It was perfect. The perfect start to a trip around the world. And so once the project finished I stepped off the ship in Barcelona and began my trip around the world. The fact that I can\’t communicate beyond a few words, doesn\’t stop me from sitting in the dirt next to them, curious about their daily lives. Driving through rural Vietnam, I pulled over after they smiled at me on my motorcycle. Three woman. One is tending to her baby, the other two are taking the leaves off and sorting red peppers. They\’re all smiling and laughing at me. All except the small baby in her mother\’s arms. 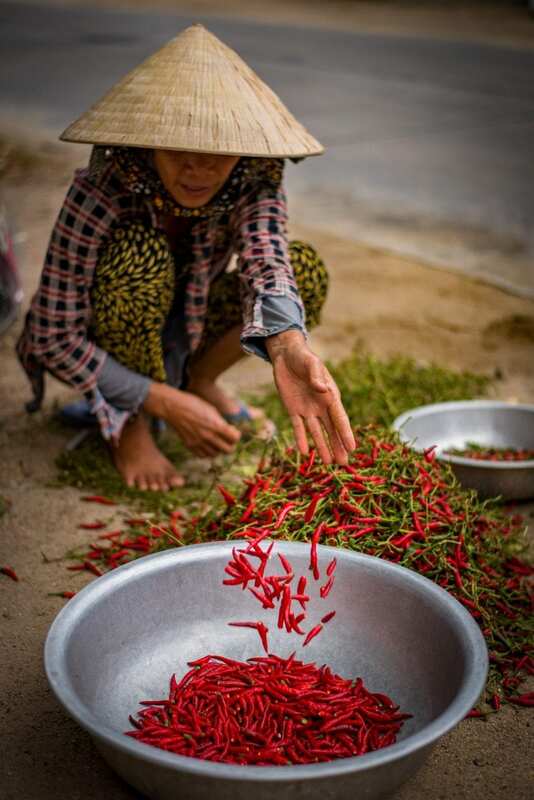 Rice, fish, salt, and peppers. Rural Vietnam along the central coast. Sometimes the work is physically demanding, sometimes the work is sitting the shade talking to your friends picking peppers. A small glimpse into the life of the Vietnamese farmer. 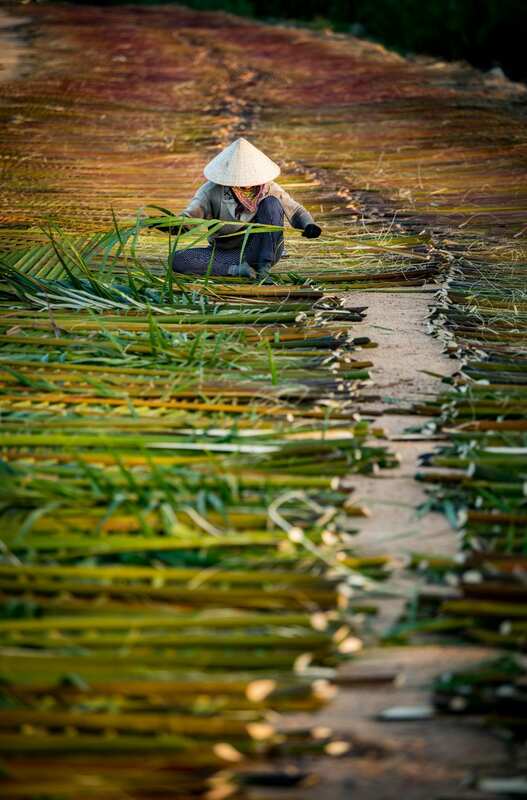 A small farming village on the outskirts of Hoi An ancient town in central Vietnam. 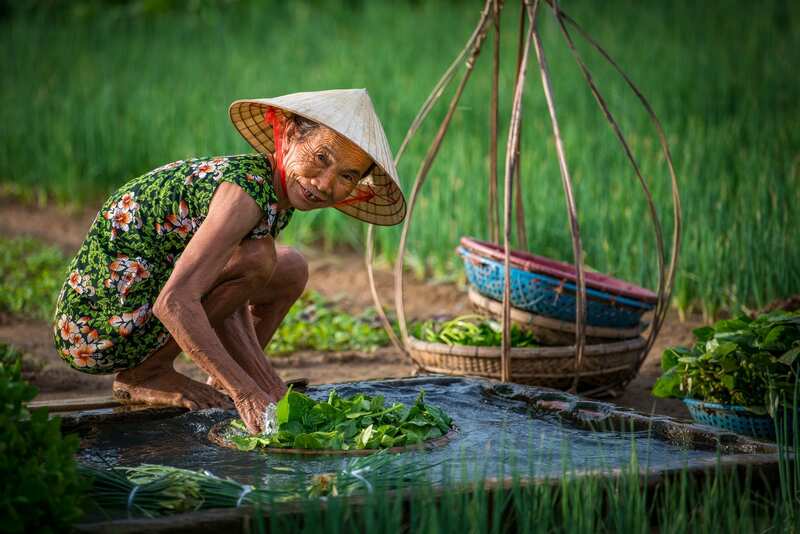 Vietnamese farmers go about their morning routines, harvesting and watering the vegetables. This woman had just brought a few baskets of freshly harvested vegetables to a tub of water to wash them and kept looking up, smiling at me. Spotting me from afar she was positively beaming. After I took some pictures she approached me to have a look at them. She laughed and pointed at her skin, weathered and brown and my skin, white. We couldn’t communicate through words, yet hand gestures and the universal language goes a long way; smiling. 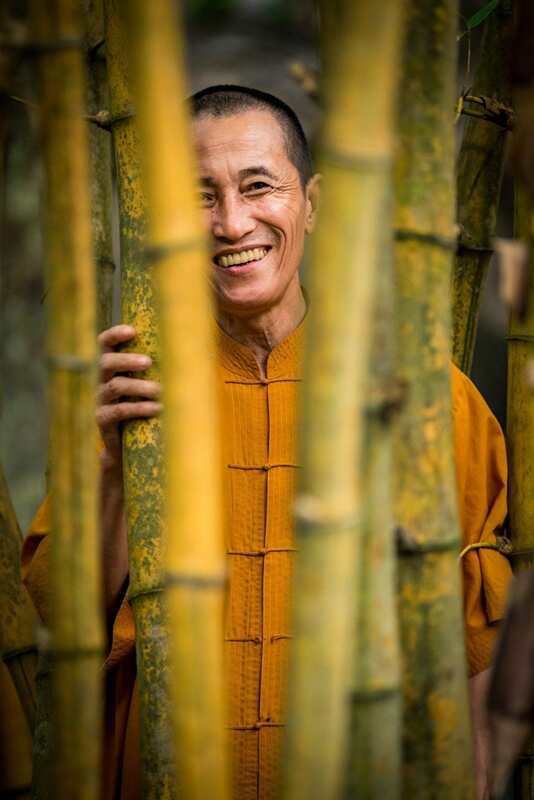 “Bamboo runs deep in Vietnamese tradition” Thich The Tuong tells me outside his modest home amongst a forrest of bamboo. 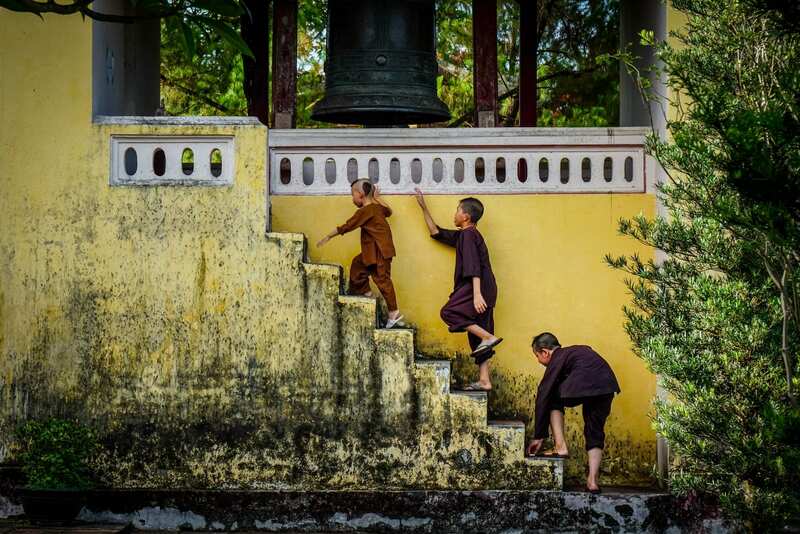 He is a Buddhist Monk with a love for growing things. Travelling across Vietnam Tuong has collected over 100 species of bamboo which he cultivates in the bamboo gardens that surround us. He has a peaceful, friendly air about him and when I ask him about his daily life he replies with a Zen Buddhist poem, simple yet somehow profound. Tuong has a dream to one day create a bamboo conservation park where he can preserve all the species of bamboo in Vietnam. Viet roof builders. \”Coconut\” he says to me with a smile as I crouch beside him. Nguyen Hiep is happy to speak to me in the bit of English he knows. He’s arranging the palm fronds together outside to dry in the sun. They much dry for about a month, at which point they will be attached together in panels, ready to be used for roofing. Palm roofs must be replaced every one or two years but they keep the building much cooler. They are so curious of me, approaching them in the rice field where they are grazing their water buffalo. Lots of smiles and laughing as I clumsily try to communicate with them. 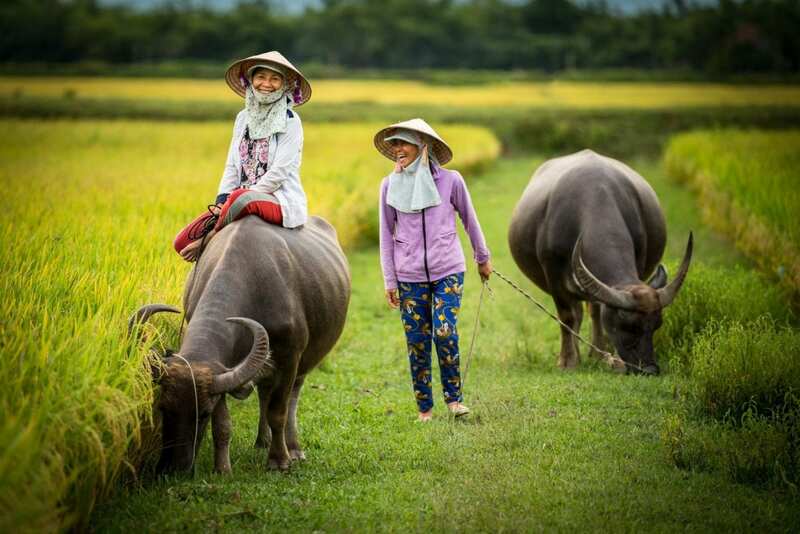 Thuy and Han (55 and 53 years old) are farmers in the countryside around Hoi An Vietnam. They are sisters in Law, neighbors and clearly good friends. Everyday they bring their water buffalo out, sitting on top of them while they graze for about 2 hours in the afternoon. As the sun sets, and amongst lots of smiling and laughter they slowly make their way back home.